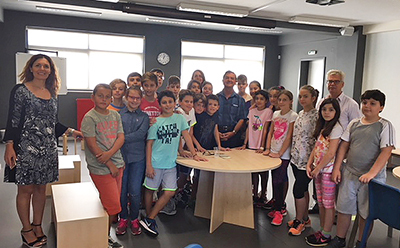 Dimitris J. Kraniou, Ph.D., professor of international economics and global management for the Rowland School of Business at Point Park University, met with students in his hometown of Kalamata, Greece. Students of the press/journalism class of Number 10 Elementary School of Paralia/Kalamata, Greece, - the school he attended as a child - interviewed Kraniou about academics in the United States, the rigors of higher education, Pittsburgh and life in America. The interview was published in the school newspaper and titled "Interview with Dimitris Kraniou, University Professor in the USA." Kalamata is a seaport city on the Mediterranean Sea. It is in the Peloponnese, the Southern part of the Greek mainland, close to many ancient sites such as Sparta, Mycenae, and Olympia. Kraniou found his way to the United States through his grandmother, who he calls one of the biggest influences in his life. She lived in Pittsburgh and told him stories about the city and the people. Her storytelling inspired him to complete his academic studies in the U.S., and he has lived in Pittsburgh ever since. Kraniou teaches international economics and quantitative management courses in the M.B.A. program at Point Park.